As a child on the island of Java, Suryo fell in love with the outdoors during many trips with an aunt who introduced him how beautiful the environment is. Young Suryo dreamed of being an archaeologist because it would allow him to work outdoors, but his parents told him he was too small for that career. 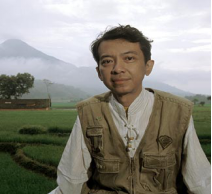 In 1982, Suryo went to west Java to work for the Green Indonesia Foundation. He realized that nature wasn't the problem, but the humans should change their attitude to nature. Then he began to teach children how to protect the environment. However, most of the schools were refusing that idea. Suryo went on and he got small group of teachers that support him. In 1990 Suryo won a Rolex Award for Enterprise. With that he was able to finish the centre for environmental education. A few years later, an environmental education centre for Bali was open in 1997 in Sanur. Suryo helped establish a similar centre in south Sulawesi. He also helped a school director start an environmental education centre. Following Suryo’s example, a group of schools began planning to own a centre in Java. Suryo is very kind to other people. His work has become an inspiration for many people. He is successfully attracting people and teaching them to care for the environment in the right way. That's why he is loved by all of us. 1. Suryo was born in _______. 2. Suryo wanted to be ______when he grew up. 3. Suryo thinks that ______ is the biggest problem to protect the environment. 4. The underlined word “establish” has the same meaning as _____ . A How to protect the environment. C The education in Java.